Sony Introduces Intelligent Surveillance | OhGizmo! By Andrew Liszewski on 03/08/06 • Leave a comment! 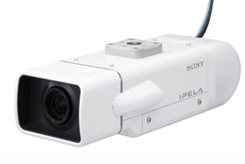 Sony has introduced the SNC-CS50P, an IP based network surveillance camera that’s a lot smarter than it’s predecessors. Using what Sony calls ‘Intelligent Object Detection’ the camera is capable of differentiating between the movement of humans and static objects and can automatically detect items or packages that may have been abandoned. (For example suspicious luggage at a busy airport.) When an object is detected it can automatically alert operators in the control room. In addition to producing high-quality images, the camera also has dual-streaming capabilities allowing it to deliver imagery in JPEG, MPEG4 and even H.264 formats. It is flexible enough to transmit both a high-resolution stream for recording and viewing purposes at the same time as a low-resolution stream that can be monitored over a limited net connection. To make installation as easy as possible, all of the image processing hardware is housed within the camera itself, and it supports ‘Power over Ethernet’ requiring only a single network cable hook-up for both camera power and data transmission.